Callan Bentley, geology faculty member at Northern Virginia Community College, leading other two-year college faculty on a field trip in conjunction with the 2010 workshop The Role of Two-Year Colleges in Geoscience Education. 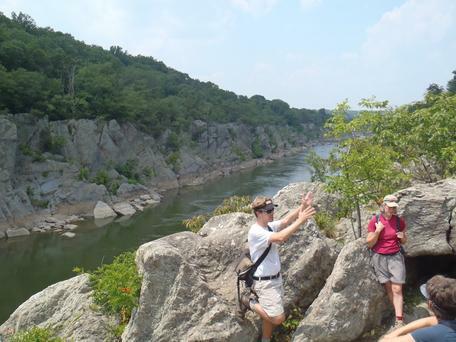 At this point, the group was hiking along the Billy Goat Trail through Mather Gorge. Those interested in learning more about teaching at a two-year college can read career profiles of faculty at two-year colleges and find out more about the faculty job search process and interviews at community colleges. Also, not only can two-year colleges prepare students for work in industry, they can also be the first step along the path for teaching at two-year colleges or four-year colleges or universities. Two-year colleges can be an attractive environment for faculty whose interest is focused on teaching. As a part of its extensive resources on Preparing for an Academic Career in the Geosciences, On the Cutting Edge has developed several pages of information related to finding a faculty position at a two-year college. What is life like as a faculty member at a two-year college? How do you actually get there? What are the challenges and benefits? We have career profiles for several 2YC faculty that get to the heart of these and other questions. Check out the collection of 2YC Faculty Career Profiles. There are many resources available for two-year college faculty to engage in professional development. There are workshops and events at professional meetings specifically for 2YC faculty as well as workshops for geoscience faculty in general. Also, the National Association of Geoscience Teachers (NAGT) has many opportunities for recognition and resources as well as a Division for Two-Year College Faculty and others interested in education at two-year colleges.